I visited the Bellevue Nursery yesterday and snapped a few pics. For a small nursery, they do a great job in decorating it for the holiday season. 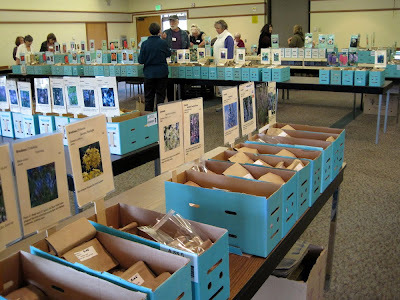 Well, I visited Sky Nursery the other day and spent some money on their 30% off spring bulbs. I purchased 18 tulip bulbs (two varieties) and a 4-pack of hyacinth. I found a couple of spots in the main p-patch plot to bury the bulbs (along with some fertilizer (don't forget to feed those bulbs!)) and covered everything up with leaves. Unfortunately, I have no more burlap to lay down and am hoping this winter won't be too windy. Also, I trimmed back the fuchsia to its base as it is dying off for the season. This plant is getting pretty darn big, almost six feet in diameter when in full growth and tends to over-shadow surrounding plants by mid-late summer. The broccoli is still going in the secondary plot. I still don't know if I will be able to harvest it before we get a hard frost, but the weather has remained rather mild so far. Keeping my fingers crossed. Winter may not be here yet, but Fall has definitely arrived. There is not so much as a lot of rain, but the overnight temperatures are hitting the mid-30's. I finished harvesting everything consumable about a month ago (finally dug up the remaining potatoes). As the above pic shows, I have added a layer of leaves and burlap over a good portion of the plot. I'm hoping it will slowly compost over the next few months. Also, I have planted a few new plants. In the foreground is a third hellebore I picked up at Swansons in their clearance section ($9.00). I was surprised to find it since it looked quite healthy, and that section tends to get half-dead stuff. In the background, where the potatoes used to be, is now a calla lily and an alstroemeria. A fellow gardener gave me them both. I'm hopefully that they will both bloom come next Summer. Now, as for the secondary plot...I've planted a bunch of broccoli starts that were free (over near the courtyard tables) about two months ago. The plants are coming along nicely, but I really don't think I'll be able to harvest any of them before Winter' first serious cold snap (note: in the last two years temps hit high 20's at least one evening, between the second week of Nov. and second week of Dec.). But, I'll keep my fingers crossed anyway. 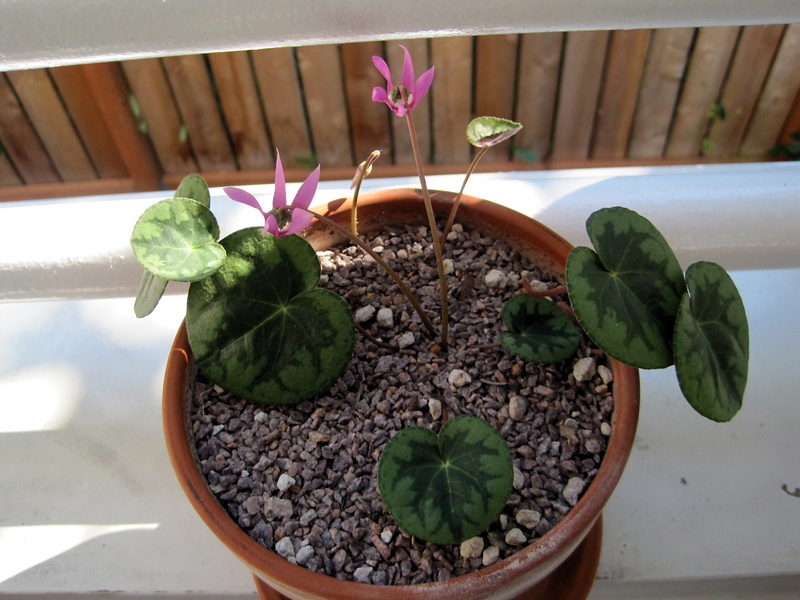 Also, the C. Hederifolium in the background came back like gangbusters. If you remember, a bit after I transplanted the plants they died back completely, with nothing remaining above-ground. I'm hoping that the new greenery will last through to next Spring. But, given the soggy NW weather, I'm not too hopeful. 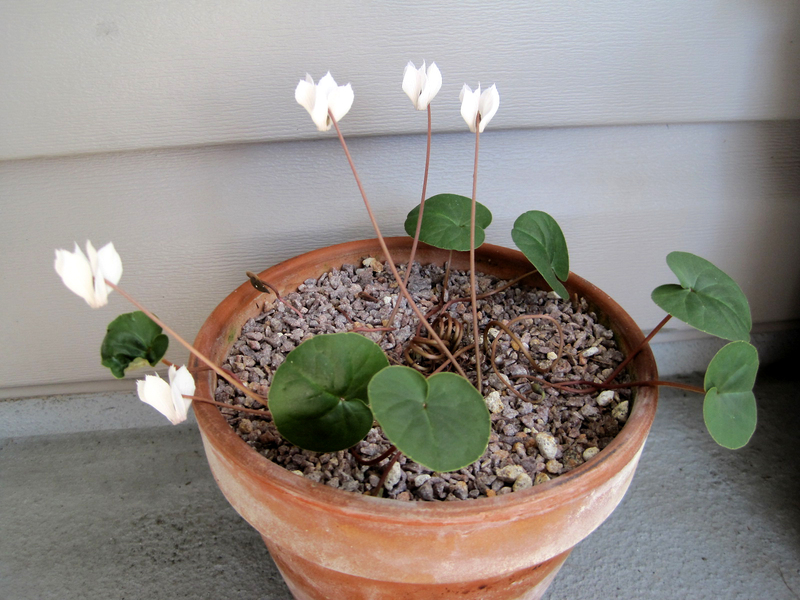 Cyclamen are native to much drier climates, and my p-patch plants tend to get a lot of water. 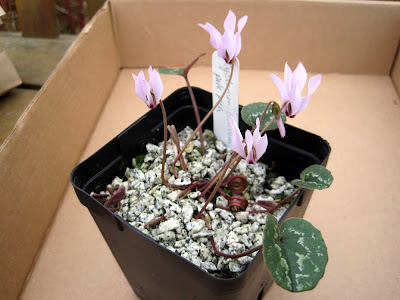 Only two of my cyclamen species are in bloom and showing growth at the moment: purpurascens and intaminatum. 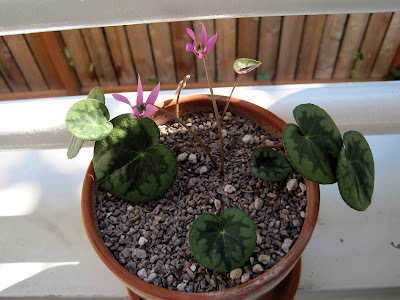 The purpurascens I acquired at Swason's Nursery last year is the most developed and has already produced nearly a dozen flowers, as well as several new green leaves. Unfortunately, other leaves on this plant are yellowing and dying off. I believe this is due to overwatering. Which is odd, as I do not fell I have watered the plant enough to have this result. So, I am trying to let this particular plant go for weeks at a time unwatered, being careful to monitor it's condition. All of the growers I have spoken with say to only water when the soil is dry (which is hard to determine for a pot this big). Maybe I will need to do some research on getting a moisture meter. As for the purpurascens corm I purchased through Hansen's Nursery (OR), it has only produced a mere couple of leaves was just polking out of the top of the soil. The intaminatum is also showing signs of growth (as seen above), with more new leaves still sprouting. I made the mistake earlier this year by adding too much water and lost all my existing leaves. Hence, I will be much more careful with future waterings. The crop of broccoli this year is the best ever. Moving the plants to the newer plot space was a great help; no club root (infected soil results in gnarled root structure that slowly kills off the plant) plagued my brassicas. Thus, many healthy, straight-standing, broccoli plants. The main plot space is nearly entirely infected with the club root virus. I have tried planting in different areas of the plot, but usually lose most of my broccoli crop each year to club root. As for the rest of things...the corn in the main plot is really beginning to take off. The celery and peas are nearly ready to harvest. Also, the latest bunch of bush beans (take two) have sprouted and are growing. I guess the soil temperature is finally warm enough. Well, temperatures continue to creep slowly towards the 70 degrees, but continue to elude Seattle. This has been great for the broccoli, spinach and peas, but hinders the summer veggies. The first planting of pre-soaked corn seeds has sprouted, and covering them for the first week with clear plastic appears to have provided enough warmth for growth. In the background (first pic) you can see plastic and remay covering the newly planted bush beans, but no growth yet. Future projects include removing the remaining spinach (looking a bit scraggly) and planting the second crop of corn. Also, I am going to construct a plastic tubing (plumber's pipe) mini hothouse for some bell peppers. The secondary plot has the peas in full bloom, and the broccoli looks fantastic (no clubroot in this patch of soil). Walla walla onions are struggling along, and I learned that the wind that blows unobstructed on this spot sorely affects warm weather crops. I'll have to keep this in mind for future crops as temperature at the garden will make or break a crop's success. I discovered the Arboretum Foundation's annual Spring Plant Sale last weekend. It's housed over at Magnuson Park in the same spot as the semi-regular Friends of the Library book sales. 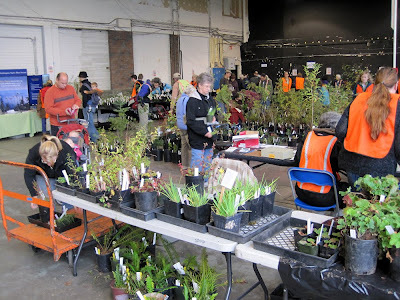 The plant sale was assuredly the largest one in the area, and (as the pics show) featured dozens of independent dealers and thousands of plants. I showed up on the first day (Saturday) with about five minutes to spare and was positioned behind the first couple of hundred folks. I only had one plant on my list: Dicentra 'Burning Hearts'. Fortunately, I found the only dealer on the site with the plant and managed to grab the last one. Mission accomplished!